A new study published in Physical Review Letters outlines how scientists could use gravitational wave experiments to test the existence of primordial black holes, gravity wells formed just moments after the Big Bang that some scientists have posited could be an explanation for dark matter. The idea is that shortly after the Big Bang, quantum mechanical fluctuations led to the density distribution of matter that we observe today in the expanding universe. It’s been suggested that some of those density fluctuations might have been large enough to result in black holes peppered throughout the universe. These so-called primordial black holes were first proposed in the early 1970s by Stephen Hawking and collaborators but have never been detected — it’s still not clear if they exist at all. The ability to detect gravitational waves, as demonstrated recently by the Laser Interferometer Gravitational-Wave Observatory (LIGO), has the potential to shed new light on the issue. Such experiments detect ripples in the fabric of spacetime associated with giant astronomical events like the collision of two black holes. LIGO has already detected several black hole mergers, and future experiments will be able to detect events that happened much further back in time. Cosmologists measure how far back in time an event occurred using redshift — the stretching of the wavelength of light associated with the expansion of the universe. Events further back in time are associated with larger redshifts. For this study, Koushiappas and Loeb calculated the redshift at which black hole mergers should no longer be detected assuming only stellar origin. They show that at a redshift of 40, which equates to about 65 million years after the Big Bang, merger events should be detected at a rate of no more than one per year, assuming stellar origin. At redshifts greater than 40, events should disappear altogether. 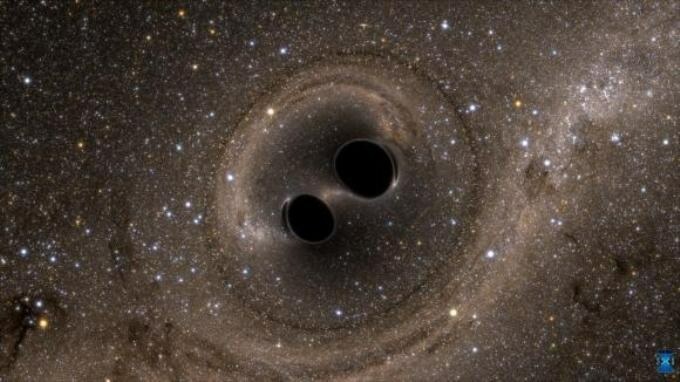 A redshift of 40 should be within reach of several proposed gravitational wave experiments. And if they detect merger events beyond that, it means one of two things, Koushiappas and Loeb say: Either primordial black holes exist, or the early universe evolved in a way that’s very different from the standard cosmological model. Either would be very important discoveries, the researchers say. For example, primordial black holes fall into a category of entities known as MACHOs, or Massive Compact Halo Objects. Some scientists have proposed that dark matter — the unseen stuff that is thought to comprise most of the mass of the universe — may be made of MACHOs in the form of primordial black holes. A detection of primordial black holes would bolster that idea, while a non-detection would cast doubt upon it. The only other possible explanation for black hole mergers at redshifts greater than 40 is that the universe is “non-Gaussian.” In the standard cosmological model, matter fluctuations in the early universe are described by a Gaussian probability distribution. A merger detection could mean matter fluctuations deviate from a Gaussian distribution. “Evidence for non-Gaussianity would require new physics to explain the origin of these fluctuations, which would be a big deal,” Loeb said. The rate at which detections are made past a redshift of 40 — if indeed such detections are made — should indicate whether they’re a sign of primordial black holes or evidence for non-Gaussianity. But a non-detection would present a strong challenge to those ideas.